For the better part of a month I've been eyeing a house in my neighborhood. 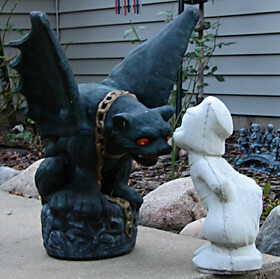 Reason being, this house has two yard sculptures perfect for the Kissing Dutch Boy project. I've been waiting for one of the homeowners to work in their yard so I could ask to get a photo or two of their yard sculptures. Fortunately, as I was driving around town placing my street art I noticed the homeowner's 18 year old son washing his truck. 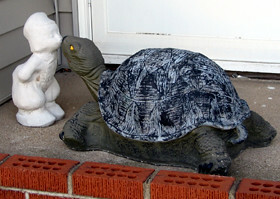 I briefly explained to him that I wanted to get a shot of the turtle with the dutch boy. He said that would be fine. Then he said "we got a gargoyle in the back if you want to get a shot of that too." OH YEAH!!! I wasn't even going to ask because I didn't want to take advantage of his hospitality. So I was pretty happy. Since he was so gracious I gave him one of my street art paintings... I think it was a fair trade. DOOOOOD, y'know what I would have let the dutch boy do to me for one of yer paintings? You should really think more of your work. You SO need to bring the dutch boy out to philli, big city pocket o wierd just waitin to happen. You know I'm looking forward to visiting Philli. In the meantime go buy yourself a dutch boy and send me YOUR photos. That could be fun. I should mention the dutch boy weighs 40 to 50 lbs. Makes it difficult to bring as carry on luggage.